Property Info: 2 Bedroom, 2 Bath Beach-front Condominium Home with 1000+ sq. ft. 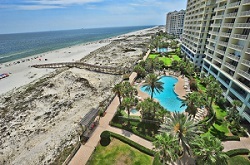 Resort condominium home for sale in Gulf Shores at the Beach Club. Incredible residence, stylishly appointed throughout – includes granite counter-tops in the kitchen, tile flooring in the living-room and dining-room, warm colors that provide a distinctive decor. This beachfront community has a great rental history, making it a good real estate investment; amenities such as covered parking, indoor/outdoor pool, exercise room, hot-tub and game-room, make this condo a great second home as well. You have to see this one…. View More >> Beach Club Condos, Gulf Shores AL.